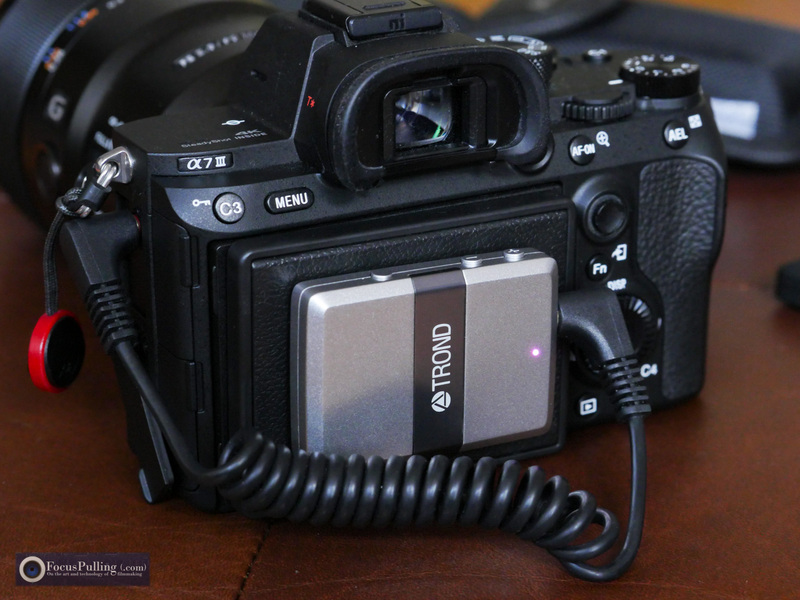 Wireless audio for filmmakers has always been a great idea, but never caught up. How hard could it be, comparing with the big advancements we’ve seen in smartphones and the like? That old guard, of radio-frequency (RF) “body packs” and hotshoe-mounted receivers, has barely changed at every level: they’re still expensive (if they’re well-built), susceptible to interference, and vulnerable to future changes in regulatory spectrum management. Meantime, the need for wireless audio has increased considerably as cameras are freely roaming around on gimbal stabilizers that shouldn’t be tethered to things by wire. 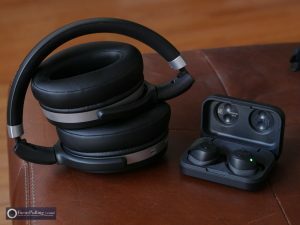 The idea for Bluetooth wireless audio to play with video, deserves a bit of history here, combined with explaining the tech behind Bluetooth’s best capabilities today. To begin with, it’s a healthy reality check to consider that Bluetooth was really designed for accessorizing computers and tablets and smartphones with nearby things like mice and keyboards. Audio headphones took things to the next level, but still, nobody ever expected the operational range to be much farther than your own pocket. 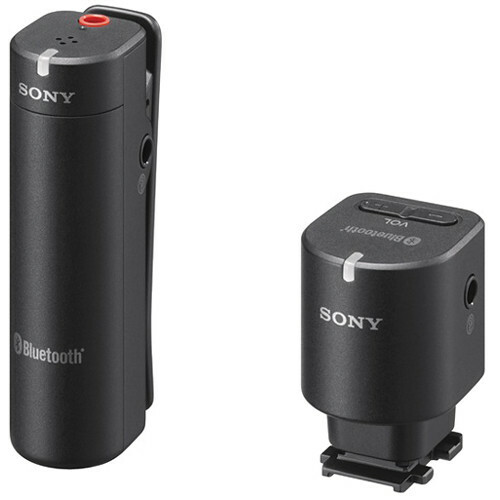 Still, one early example when Bluetooth tiptoed into video camera audio, was Sony’s ECM-W1M that hooked into the Multi-Interface Shoe on compatible Sony cameras like the a7 series. One nice thing about this, was to get a direct audio connection that way, adding bus power to the receiver — no cables, low maintenance. I had even bought its predecessor version when camcorders like the NEX-VG10 used a similar mount called the Active Interface Shoe. But both versions had big problems: incredibly, Sony grayed out manual volume control capability, enforcing automatic gain control, causing even worse quality (and in typical Sony behavior, they totally ignored the unanimous customer outcry demanding an ability to merely control volume — Sony Corporation being stubborn as always). The microphone was a big cigarette lighter-shaped thing that you could never conceal like a lavalier. And the latency (a term to describe the audio delay introduced by the wireless protocol, causing sound to go out of sync with talking heads) was too high. Basically, it sounded bad, and didn’t work well. Now, a little about Bluetooth. You’ve probably seen the version numbers, that currently peak at 4.2 for most of us. In reality, those specs don’t relate much to audio quality, especially in this context. What’s important is actually a different delivery layer on top of Bluetooth, that began with aptX in its original vanilla form, then became aptX HD, and now has evolved into aptX Low Latency. Qualcomm, who acquired the technology and doesn’t seem motivated to do anything with it, really botched these confusing terms, into bad brand confusion for consumers. But here’s a helpful chart to explain its impact on us, as filmmakers who always need to keep sound and picture in sync: The numbers speak for themselves, but to put it simply, you need aptX Low Latency capability on both your transmitting and receiving ends, to get a nearly imperceptible delay/lag/latency of around 40 milliseconds. Can you still tell the difference, even so? Yes! But especially when monitoring audio, 40ms is just fine. So we want to find products that are clearly labeled with “aptX Low Latency.” There are surprisingly very few (here is the official list), and you have to be careful when the manufacturers of Bluetooth devices are actually too stupid to know the difference themselves. This is literally the first digital audio recorder in the world to transmit live audio monitoring via Bluetooth using aptX Low Latency. 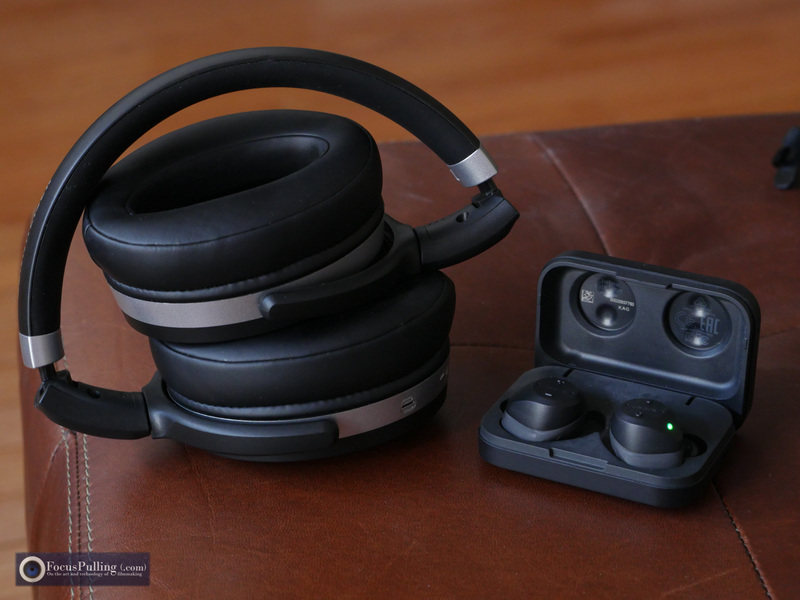 So, when you have wireless headphones whose specs actually say aptX Low Latency, you can leave the R-07 wherever you need to, and monitor the audio wirelessly from a few feet away. This is huge, actually. For me, my shooting style has dramatically tilted in favor of “Steadicam” work (i.e., floating my camera on a 3-axis motorized gimbal stabilizer, such as those by Zhiyun, Film Power, CAME-TV and DJI). It’s really impractical, and bad for balance, to try and mount a wireless receiver somewhere onto the handle (adding weight too), with a wire hooked into the constantly tilting and rotating camera. Until now, I’ve compromised by just hooking an Aputure A.lav ez into a smartphone (while the talent stashes the phone into their pocket), recording mono audio files at uncompressed 48 kHz 24-bit audio — it actually sounds better than a wireless connection, but I do need to sync it up in post which is simple and automatic these days. But this is a frightening gamble, and yeah, I’ve gotten back to the studio heartbroken, hearing wind noise I didn’t expect, or shorter files because of battery life/storage space, or ruffling of fabric, or crackling — these are all things I could have addressed if I were listening to what the smartphone was recording, while it happened. And of course, smartphones aren’t purpose-built for professional audio recording. But at least, I got full freedom of movement, and hardly spent any money on the whole audio rig. Today, there are a few digital audio recorders that transmit wirelessly (including Bluetooth and Wi-Fi), but never during recording and only at playback. So, I got really excited about the arrival of the Roland R-07. I’m glad to say that it mostly delivers, especially when you combine it with extremely small and affordable accessories by Trond as explained a little later. I found the sonic quality using even the built-in stereo microphones surprisingly adequate. In order to protect against wind noise (these capsules are very sensitive), I did find the exact perfect fit at the tiniest expense, under ten bucks, from Amazon here (the one that says it’s for the H1). It’s a very tight fit, but that’s what you want. 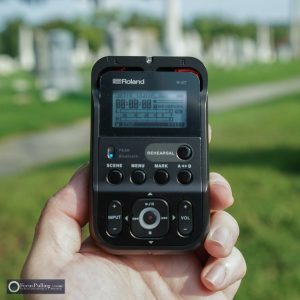 When it comes to recording modes, this is just a two-track recorder, however, there is a dual-recording mode so that you can store a parallel stereo version with the volume turned down, in case you get high-amplitude clipping at the higher-volume stereo version. 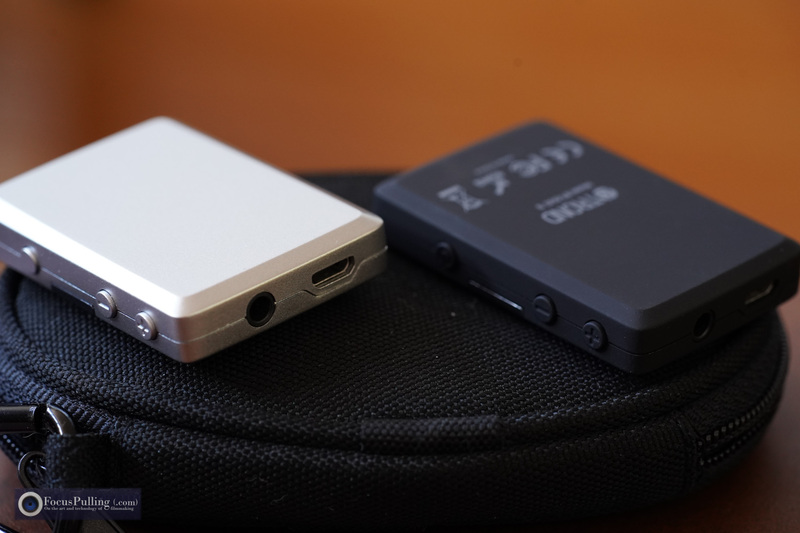 When it comes to battery power, besides the two AA batteries that last up to 15 hours, you can provide USB bus power into the microUSB jack that doubles as a data interface (though I wish everyone would finally migrate over to USB-C — there’s just no excuse anymore). Turning back to the crowning feature, of live audio monitoring via Bluetooth during recording, let’s start with the worst case scenario to propose that it’s actually not so bad. Shown here, I’ve got two product levels beneath what we really want, aptX Low Latency: some Jabra Elite Sport earbuds with basic “SBC” (low-complexity subband codec) Bluetooth, and the Sennheiser HD 4.50 headphones with active noise reduction and plain vanilla aptX. From the earlier chart above, you can see how the Jabras are about 1/4 second off: that’s not horrible, but it’s freaky as you watch people talking out of sync with what you see. Then, the Senns get you down to 180ms, closing the gap. Both of these options aren’t ideal, but when you think about it, you’re going to fully sync back in post anyway, and the goal of monitoring audio is to audit the quality for problems, and to fix them. When you’re flying a camera on a gimbal, hearing things 1/4 second behind won’t be enough of a delay to screw up where you’re supposed to point the camera, etc. It just feels weird — and it also gets a little difficult understanding the talent when you converse with them, and hear a sort of echo chamber in your ear. But I tried both of these, and it wasn’t bad. But why not eliminate as much latency as possible? 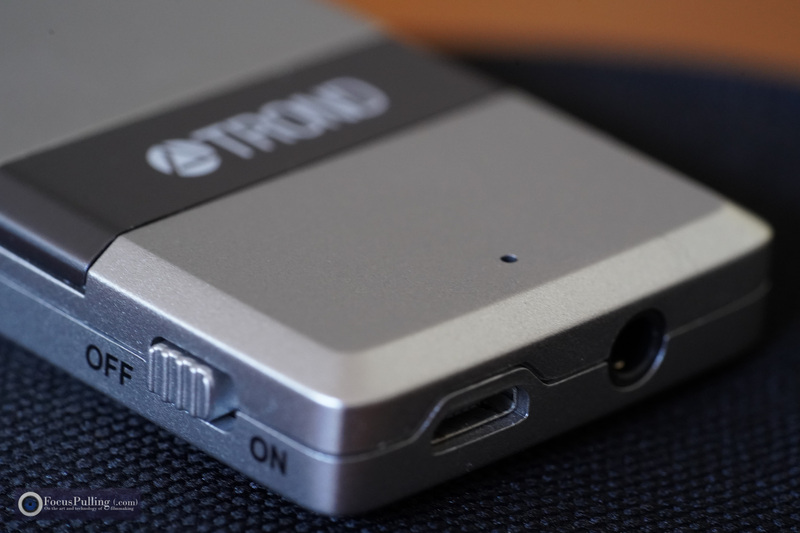 While there are hardly any headphones including native aptX Low Latency, a company called Trond makes the best and most affordable adapters to accomplish the same, or better. 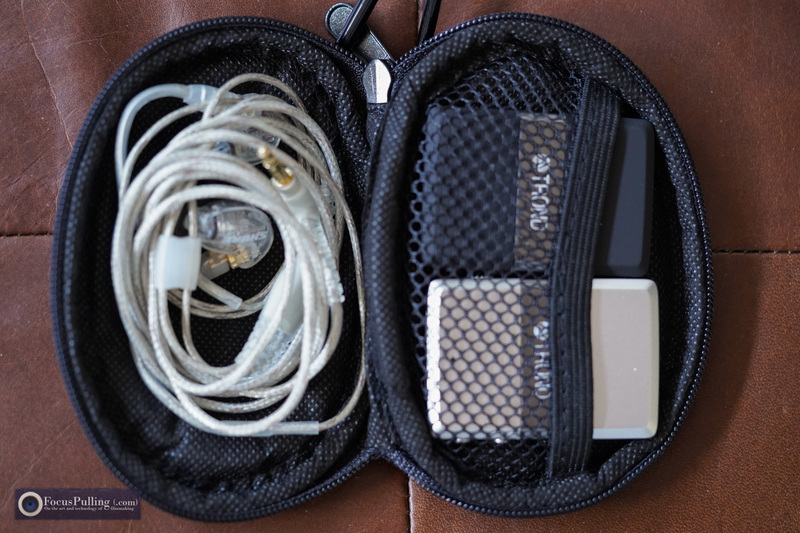 Pictured here are some wired Shure earbuds stashed with some Trond adapters into an incredibly portable form factor. Remember my earlier list of three feature options? These things accomplish all of them. For the first option, you use the silver Trond BT-RX S shown here. It’s a receiver-only device for about twenty bucks that’s compatible with aptX Low Latency. It has an internal 200mAh rechargeable battery, which runs about 15 hours, and you just plug in any headphones that you already have. After pairing once with the Roland R-07, that association stays in both of their memory banks, and re-connecting each time is just a few clicks away (buried a little in the R-07’s Bluetooth menu). So, let’s say you’re flying a Sony a7 III on a Crane gimbal stabilizer: you’ve got the Trond in your pocket, and you’re wearing wired headphones hooked into it. You’re hearing everything that the talent is saying into their clipped-on lavalier microphone, which is wired into the R-07 hidden in the talent’s pocket. The R-07 is recording internally, but you’re able to hear exactly what it’s recording. 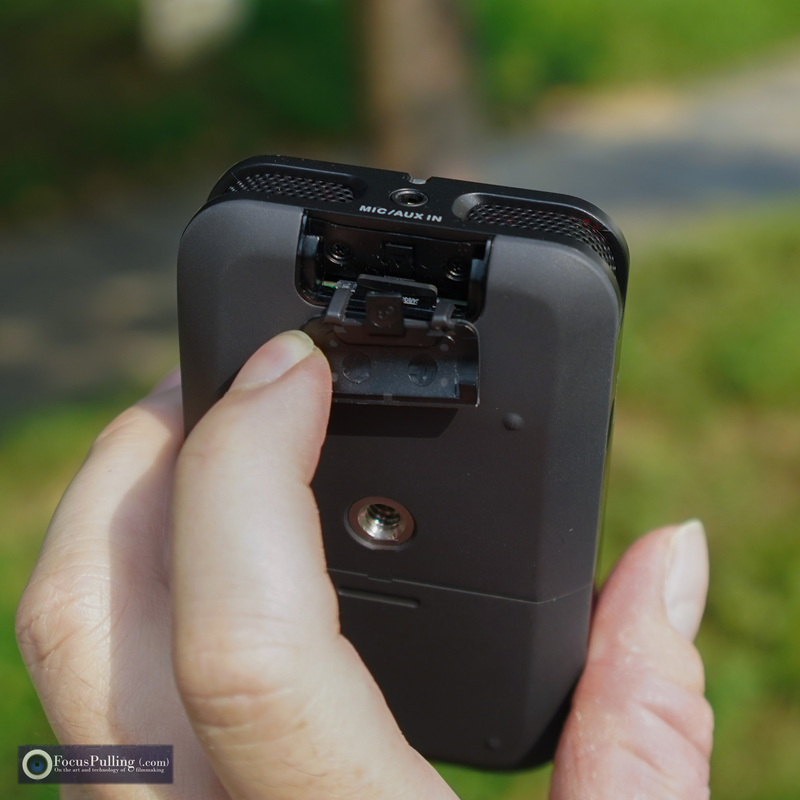 Using an included smartphone app for iOS or Android, you can even connect to the R-07 via another simultaneous Bluetooth connection, remotely controlling the audio transport controls, levels, etc. But you’re also free to dedicate all of your energy to operating the camera. You’ll sync up the R-07 audio files in, let’s say, Adobe Premiere by just selecting the relevant pair of video and audio files, right-clicking, and synchronizing them by audio. Premiere will use the reference of the bad-quality in-camera microphones for sync, but you’ll mute that version, to only use the synced high-quality R-07 audio. If you’re wondering about the mount, it’s on a Vello sun-shade that flips up when I’m not using the eyepiece. The second option is a slight variation on this, still only using the silver Trond: repeating most of the above, instead of plugging headphones into the Trond itself, you can feed the Trond’s receiving audio output into the camera’s microphone input, recording mostly in sync (only 40ms off, a basically imperceptible delay), while plugging your headphones into the camera’s headphone output for monitoring the audio. One big caveat here, requiring caution: the Trond audio output is at an impedance commonly called “line-level” which is different than for microphones, so it will sound really loud! You’ve got to turn the volume way down, first on the camera’s receiving side (I estimate about 1/3 the normal level), then at the R-07 according to taste and careful not to clip at the camera destination. 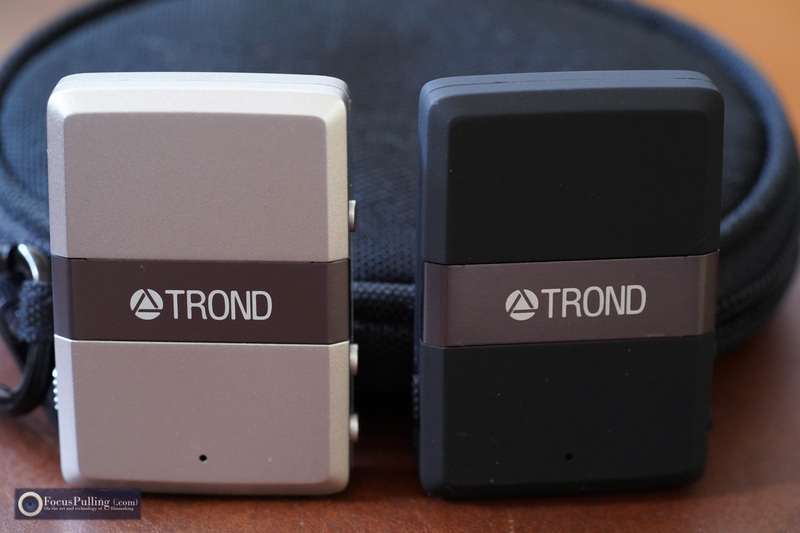 The Trond has volume controls too, but you don’t want to attenuate there too much, being at the middle point, to keep noise to a minimum. Basically, what this all accomplishes is a better-quality recorded audio track in the final camera video/audio file, even though the R-07 will always be better. So, let’s say you’re on a tight schedule, or actually you just can’t hear the difference between the two: this might do (and save you some time from syncing in post)! Finally, the third option frankly is not advisable! Bluetooth uses unlicensed, shared spectrum that’s highly congested and, as mentioned earlier, really designed for short distances (even less than a nearby steadicam). So the possibility for interference is even worse than RF wireless packs, and even its Wi-Fi variants. But if you’re in a bind and really need ultra-portable (and ultra-cheap) wireless connectivity — assured that you’re at least able to monitor in real time, should there be drop-outs — then here’s an option that doesn’t even require the Roland, for about fifty bucks. A few caveats: just like at the receiver side, when you add the black Trond BT-DUO S and switch it to transmitter (TX) mode, the 1/8″ stereo jack is also a “line-level” input not designed for microphones, and also without plug-in power capability to drive a condenser microphone, such as any typical lavalier clip-on. 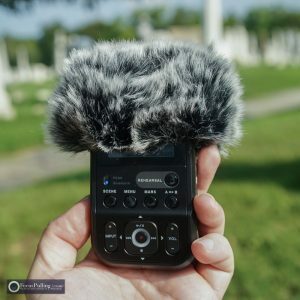 Therefore you also need to have a microphone that receives power through an in-line module (my favorite, that I’ve been using for years, is the Audio-Technica AT899) before arriving at the black Trond transmitter. And, like the second option, you still need to carefully adjust levels because of the mis-matched impedances. But once you’re up and running, taking special care, this is about as portable and as cheap as you can get. 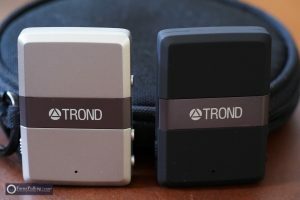 There are quite a few Bluetooth adapters on the market, but Trond is by far the highest quality, with actual customer service, and clearly compatible with aptX Low Latency — which is still a rare feature to find, often thrown around incorrectly, overlooking the difference between its variants. Also, no matter what you’re using, Bluetooth pairing can be inherently finicky: I had a little trouble getting these two units to pair, suspecting that when I switched away from RX to TX and then back again on the BT-DUO S, it finally got happy — but once these little fellows get acquainted, they stay friends, and pair automatically at boot. So the time is now, finally, for filmmakers to consider more choices that are smaller, cheaper, and more versatile, in this fantastic quest to get rid of wires. I love how these products are pushing the limits, and I highly recommend them.